Piney Z home sales appear to be picking up ever-so-slightly. As the real estate graph at the right shows, buyers are currently choosing to buy a larger Piney Z home as values continue to fall.. 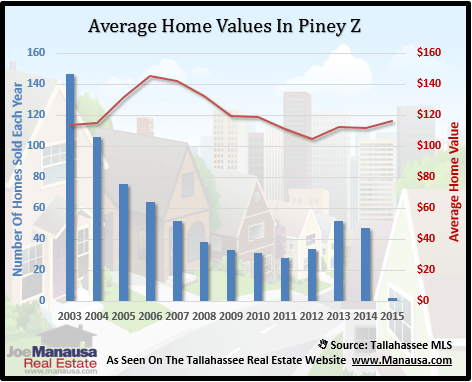 If you recall from our last Piney Z Home Sales Report, this popular NE Tallahassee neighborhood has the unfortunate distinction of owning the record for the most consecutive declining years in home sales. Currently, there are 20 homes for sale in Piney Z, and our current rate of sales would make 2012 the second-worst year in the past 11 years. The average Piney Z home price has dropped to $188,000, which is 27% lower than average prices were at the peak of the housing market. Piney Z home values have fared a little worse, falling 29% from $145 per square foot in 2006 to the present values of $103 per square foot. 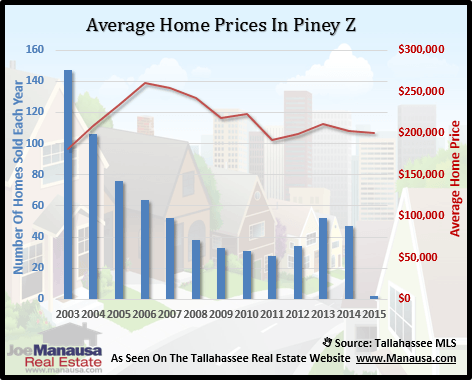 I hope this Piney Z Home Sales Report has provided valuable information to you and don't forget to check back for updates and other Tallahassee real estate reports.